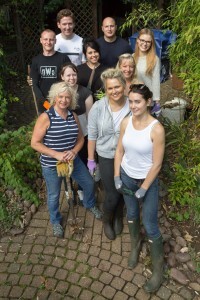 STAFF from Surrey County Council visited Woking Hospice on Friday to help brighten up the charity’s gardens. Under the ‘Employee Volunteering Scheme’, council workers can take up to two days off each year to give something back to the community; and Lucy Collier, Elliot Sinclair, Emily Sabine, Amanda Lloyd, Ann Attewell, Caitlin Docker, Natasha Moore, Rachel Basham, Ashley field and Andrew Finch were happy to oblige and get stuck in with some gardening. They were joined by four of the hospice’s regular volunteers with tools at the ready. Lucy explained: “We chose to help here at Woking Hospice after looking into various charities as we wanted to make sure we were volunteering somewhere we could really make a difference. Volunteers found the experience useful in many ways. “We’ve all had a great day, it’s been so valuable and we’ve really enjoyed it,” said Leadership Office Manager for the council, Elliot. “Aside from the gardening we’ve learned so much about the hospices and the extent of the support they provide for patients which we had no idea about before. HR Director at the Hospices, Liz Cussans, who organised the volunteering day added: “The volunteers have done a fantastic job, the gardens look really good and they’ve left very happy with the experience.